Unfortunately living on a farm in the woods can be quite painful! There's a lot of manual labor and I often end up with aches and pains, especially when I have to chop wood or shovel snow in the winter. Ugh! Luckily I have a bunch of herbal remedies to turn to help alleviate pain. However, there does come a time...often in the dead of winter...when I run out of last summer's dried medicinal herbs from the garden. At that point I often turn to the herbs and spices in my kitchen cabinet instead of OTC or prescription remedies for natural pain relief. 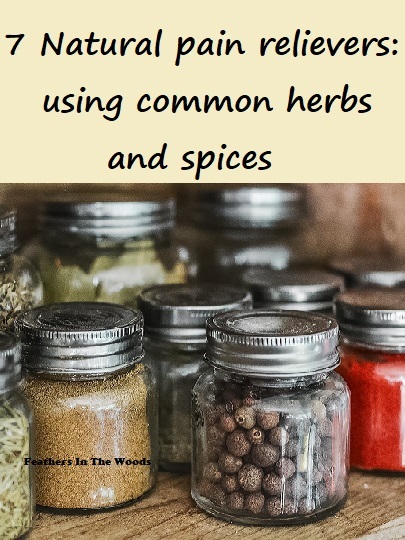 I also use these 11 herbs to help with digestion since many of the herbs can be grown indoors in winter. I know I'm not the only one who prefers to use natural remedies! 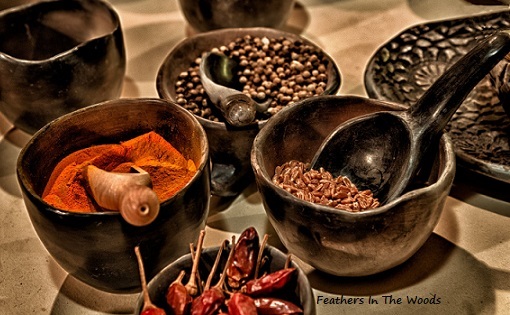 A large number of pain sufferers are turning to a more natural approach by using the methods of the past to treat the ailments of the present...and some of these herbs have been used for centuries! Capsaicin is derived from chili peppers and is often seen in OTC creams used for arthritis and joint pain. The cream can be applied several times a day as needed to reach full effectiveness. You can also get some capsaicin benefits from eating/cooking with the peppers. Though there is not doubt that capsaicin can alleviate pain (they even have Rx patches of it!) nobody is really sure how it works. Cloves contain an agent called eugenol, which has been found to reduce pain during topical application. Studies in 2006 concluded that clove gel was just as effective as a chemical gel at reducing pain in the gums of test subjects. Many dentists still use oil of clove in numbing gels (mine does!) Unfortunately since this one only works topically, it seems to only help mouth pain. Some people chew on a clove bud to help with throat pain. Fennel has been used for thousands of years to help with digestion issues, and stop painful bloating, but one of the other amazing things about fennel, is its ability to help soothe muscle pain naturally. This is caused by its tendency to relax muscles, and has been used for relief of menstrual pain in women in this study. This rhizome is famous for it's stomach calming tendencies, but it’s also been found to have anti-inflammatory properties. Ginger has many health benefits along with reducing inflammation and pain, including muscle aches. The upside of ginger (and all of these herbs and spices!) is that it does not have the side effects of pharmaceutical pain medication. Parsley Yet another anti inflammatory herb with a many other health benefits. Parsley can be found in almost any grocery store fresh or as a tea and has a light 'grassy' flavor. Chewing parsley also helps alleviate bad breath. Related reading: 10 Natural Alternatives for Pain Relief from The Hearty Soul. Hopefully you have these 7 herbs and spices in your kitchen when you need them to help alleviate pain naturally. If not then maybe it's time to stock up? Looking for more natural cures? Check out these 50 Home remedies that relieve heartburn without medication. That is a great post idea....I'll have to work on that. Sorry to hear about your back, I went through 2 years of back pain so I understand where you're coming from! That's actually why I started taking the turmeric. Capsaicin comes in creams that you can rub directly into the sore areas. I also use ginger in water! I slice fresh ginger into a small pot of water and bring it to a simmer, then put the lid on and let it simmer for 5-10 minutes. Let cool and store it in the refrigerator for a few days. I add it to my water bottle with some lemon every day, but it's great as a tea also. I buy parsley tea bags, or add some dried or fresh parsley to my tea when I make loose leaf tea. Many of these can be bought in capsule form, or you could fill empty capsules yourself.